The ALL NEW Top Half Car Cover! 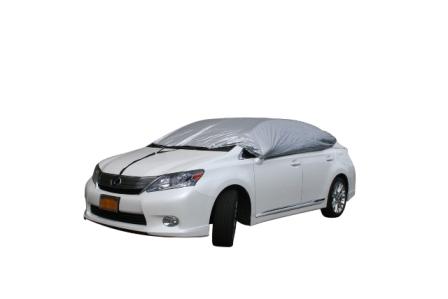 The Top Half Car Cover is easy to use and covers only the top half or cabin of the car. It is made from high quality material that is UV resistant, heat reflective and unlike other top covers is made for ALL WEATHER CONDITIONS! It�ll keep your car�s interior cool in the summer which means no more burning your thighs on hot leather! it will also help prevent your interior from fading due to the harmful effects of UV rays. In winter, it helps prevent the buildup of ice and snow on the glass or cabin area area so there is no more scraping your windshield and windows! Just take the cover off and off comes the snow as well. Hands down, there is nothing on the market that compares with this product. Comes with a 1 Year Warranty!